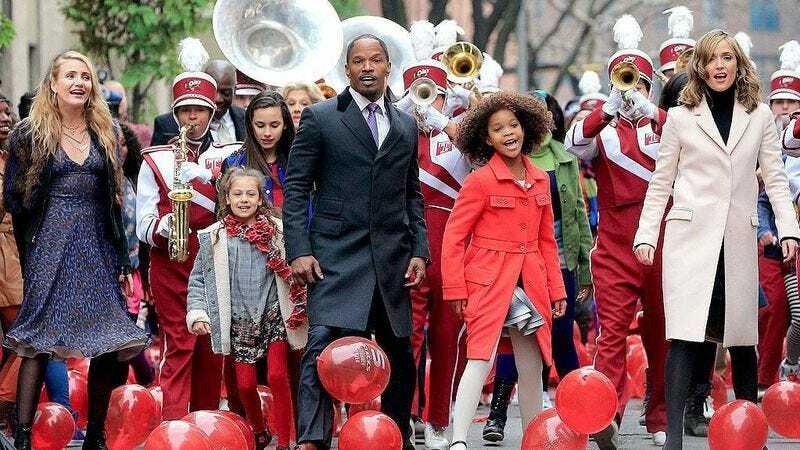 Quvenzhané Wallis’ performance in Annie should effectively silence people who grumbled at the casting of a black child in a role traditionally performed by redheaded white girls. At 11, Wallis is superhumanly adorable in the title role, and her dogged optimism and energetic charm compensate for the weaknesses in her vocal performance. Hating Wallis is like hating ice cream on a summer’s afternoon, and it’s a good thing that little girls of many colors can find some version of themselves in the multiracial cast of this musical reboot. But Broadway purists determined to hate Annie need not fear, because there’s plenty worth complaining about. The adult cast is agreeable at best. Any scene without Wallis and her gang of remarkably symmetrical, well-groomed orphans feels like a chore—“Let’s just get through this,” the movie seems to be saying, “Then we’ll show you that cute little girl and her puppy again.” Jamie Foxx, apparently savvy enough to realize this isn’t about him, wisely dials it back as cell phone magnate Will Stacks. Rose Byrne is tender, if anemic, as Grace, the Pepper Potts to Foxx’s Tony Stark. The villains don’t fare as well, and Bobby Cannavale seems faintly embarrassed by his performance as a new character, scheming campaign manager Guy. But the real humiliation is reserved for Cameron Diaz as Miss Hannigan, re-imagined here as a shrill, washed-up backup singer for C + C Music Factory. Diaz seems to have been working with a different director than everyone else, one who kept yelling, “More! more!,” as she stumbled around the IKEA-furnished apartment we are supposed to believe is the nadir of urban poverty in—gasp!—Harlem. In between is standout supporting player Stephanie Kurtzuba as a Russian-accented social worker who provides a few good laughs. One big change from the musical is the way that Annie and Stacks cross paths: Rather than Grace showing up at Annie’s door in search of an orphan to come over for Christmas, the two meet coincidentally when Stacks saves Annie from being hit by a van. Stacks is polling poorly in the New York mayoral race when this happens, and Guy convinces him that a photo op with the girl, which eventually turns into her moving into his penthouse, will be great PR for his campaign. 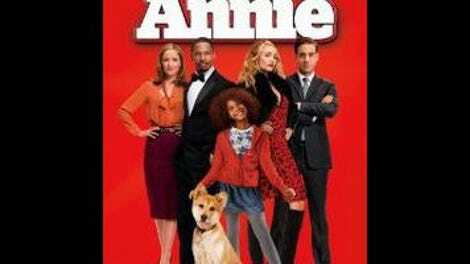 This cynical plotline is just one of the changes meant to make Annie more contemporary, like turning the title character into a foster child instead of an orphan, presumably because orphanages are going out of style. Then there are the obligatory social-media references (this Annie is a Twitter celebrity), slang (“throwing shade” is used), and hip-hop beats. Actually, the last one makes the most sense considering Jay Z is one of the movie’s producers, although it does raise the question of whether this whole production was based on the fact that Jay sampled “Hard Knock Life” back in 1998 (and yes, this Annie does put the beat behind it). A nod to Stomp, a subplot about the educational system failing our plucky young heroine, and a scene positing that location tracking on cell phones is fine, because it can be used to find lost children, complete Annie’s attempts at 21st-century relevancy. The treatment of Stacks’ self-made billionaire status is especially troublesome, removing the Great Depression elements of the musical while enthusiastically preaching capitalist meritocracy. Annie spends a significant amount of time focusing on the couches and swimming pools and high-tech gadgets in Stacks’ penthouse, every surface polished to a gleaming, very expensive-looking shine. But, as the movie reminds us over and over, it’s okay that he’s so rich, because he earned it through hard work. (Cannavale and Diaz, on the other hand, are looking for an easy way out.) At one point, Annie accompanies Stacks as he makes sure all his cell phone towers are working, which is somehow accomplished by flying over them in a helicopter. Soaring over Manhattan in a symbol of Stack’s capitalist empire, Annie asks how he became so wealthy. “I worked very, very hard,” he tells her.